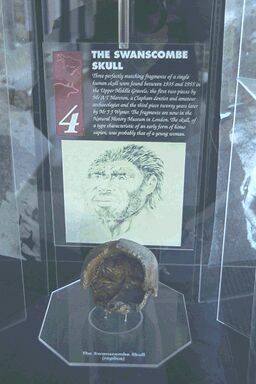 Swanscombe is famous across the world for its spectacular finds of Early Man. Flint tools dating back 400,000 years to the early Stone Age - the Palaeolithic - litter the buried landscape under the current town. Incredibly, three different pieces of the same skull - the Swanscombe Skull - were found on separate occasions 1935, 1936 and 1955. 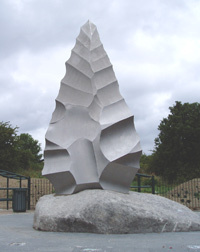 The Swanscombe Heritage Park, in the former Barnfield Pit quarry, is landscaped across the deposits that contained these finds. 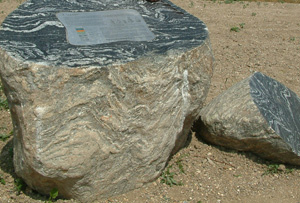 An accessible trail winds through the site; information boards etched into giant granite blocks explain the sequence of deposits and stone pillars show where the skull fragments were found. The site has been designated a Site of Special Scientific Interest (SSSI) and also a National Nature Reserve (NNR). For more information about SSSI's and NNR's, please click here, where you will be redirected to Natural England's website and will find a vast array of information which will help you understand the importance of such sites and why they need to be protected. Explore this site to discover the Stone Age beneath your feet; then visit us for real!